IT begins with Anna Maxwell Martin on a steam train and David Morrissey riding a horse. Both heading for the same destination. If you’re in the UK and able to watch, do yourself a favour tomorrow (Sunday). Record anything else you might want to catch and settle down to watch BBC1 at 9pm. South Riding is a glorious three-part drama that will make you laugh and cry in equal measure. With some of the best performances I’ve seen on screen in many a year. Together with a cracking script telling a gripping story, beautifully filmed for our Sunday evening pleasure. My feature on the drama is in today’s Manchester Evening News. I’ve posted it online below, followed by some audio from Peter Firth. Also check out the links at the bottom of the blog, including the official BBC site which currently features two background videos on the making of the series. “PLEASE don’t be afraid. The future belongs to you,” headmistress Sarah Burton tells young women about to leave Kiplington High School. Sarah is a remarkable woman. A 1930s lady in red who returns home from London to change lives forever. South Riding (BBC1, Sunday, 9pm) is a television treat destined to be near the top of the class when the awards are handed out. Made by BBC Productions Manchester, it’s a three part adaptation by acclaimed screenwriter Andrew Davies of Winifred Holtby’s novel, first published in 1936. 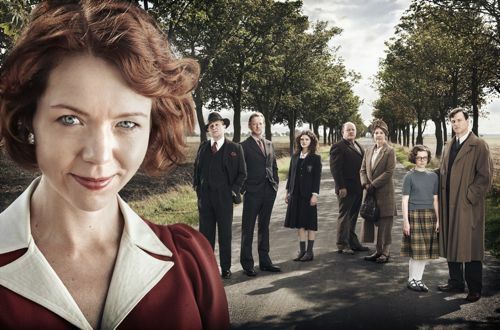 Anna Maxwell Martin plays fiery blacksmith’s daughter Sarah, who goes back to Yorkshire to take charge of the crumbling local girls’ school with the country still in the grip of economic depression. 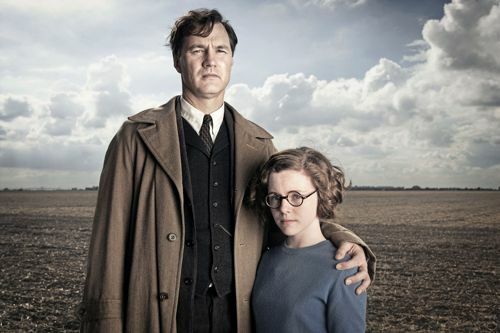 Her pupils include gifted Lydia (Charlie May-Clark), who lives in a clifftop slum, and Midge (Katherine McGolpin), the daughter of struggling gentleman farmer, councillor and school governor Robert Carne (David Morrissey). Although you’d never guess from her performance on screen, Anna found standing up in front of her screen pupils a daunting experience. “It was terrifying – it’s quite frightening trying to be inspirational. I would never dare be a teacher, I would be far too scared,” she says. Sarah lost the love of her life in the First World War and isn’t looking to replace him. But passions stir with Carne, even though he is dead set against her plans for the school and has his own personal heartbreak to deal with. Episode two finds Sarah Christmas shopping in Manchester and bumping into Carne in the same city centre hotel, where they have both booked rooms for the night. The dinner dance band play Love Is The Sweetest Thing. But nothing is quite that straightforward in this engrossing tale. “South Riding is a rollicking great story about unrequited love and social conscience,” says David. “What’s relevant to a modern audience is that it is set in a time when there is great economic hardship. Spooks star Peter Firth takes a break from MI5’s Sir Harry Pearce to play corrupt councillor Anthony Snaith, complete with blond wig, a sprinkling of black humour and a cat called Edgar. He believes the story will grip 21st century viewers. “It’s a really early feminist novel. Then, for a woman to behave like that was very, very unusual. Now it’s commonplace, of course. 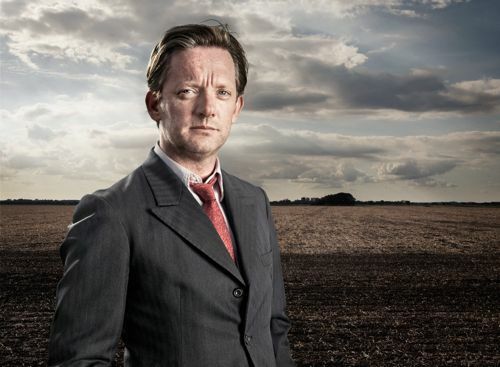 Other star turns include Douglas Henshall as councillor Joe Astell, Penelope Wilton as Mrs Beddows and Shaun Dooley as Lydia’s father Mr Holly. 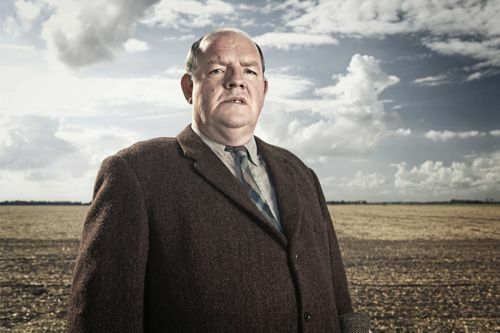 Manchester-born Early Doors star John Henshaw also makes a big impression as haulage contractor, councillor and preacher Alfred Huggins. Author Winifred wrote South Riding just before her death 75 years ago at the age of 37. 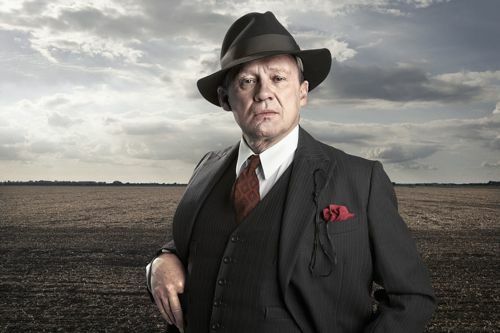 Peter Firth doesn’t get a huge amount of screen time as Alderman Snaith. But his scenes are certainly memorable. Including a moment in episode three which should certainly win the BAFTA for Best Line Delivered To A Cat. 4. Speculation that the next – 10th – series of Spooks may be the last? 5. No decisions made on Spooks? Posted in News and tagged Anna Maxwell Martin, David Morrissey, Douglas Henshall, John Henshaw, Penelope Wilton, Peter Firth, South Riding, Winifred Holtby. Bookmark the permalink. Wouldn’t it be ironic if Peter did get a BAFTA for his guest role in South Riding, after all the hard work he’s done on Spooks! Ian, did you ask Peter how he felt getting back on screen with Penelope Wilton? They were last together on screen in “The Sullen Sisters” back in 1972. Sadly I didn’t, Elaine. Will try to remember for next time. Really looking forward to this, Ian. Thanks for the blog entry, and especially for the extra Peter Firth audio! Much appreciated. I really am looking forward to this. Ian you are so wonderful with the audio files of Peter Firth!! You sure do know how to make us Spooks fans happy!!! Between the Nicola interview and even interviewing Peter for South Riding you do make us happy!!! Fantastic blog as always!! Thanks for this Ian – great interview with Peter and LOVED the audio files with him too 🙂 Am sooooooo relieved it was a wig for South Riding! Thank you for doing your best in interrogating Peter regarding the future of SPOOKS post S10. You were too nice – maybe next time dress him in a paper boiler suit and threaten him with an injection or two!! Thanks Elaine, Lucy, Jodie & Karen for taking the time to post a comment. Really appreciated. Karen – you are, of course, correct. But it’s never fair to press an actor at this stage in a long running drama, while a new series has still to be filmed. My guess is that Peter could have said a lot more about the future (or not) of Spooks. But this wasn’t the time to reveal what he knows. Why oh why did you have to leave us with “My guess is that Peter could have said a lot more …”? Now I won’t be able to sleep, wondering what Peter Firth does know about the future of Spooks! ! You are of course correct in that it would be bad form for an actor to comment on Spooks whilst doing publicity for South Riding. I wish the BBC would be a little more professional, like the American TV networks, when it comes to announcing their plans about a long running series, and not keep fans guessing till the last minute. Does nothing for my mental heath!!! Just my guess, Elaine, and I could be wrong! As you know, we’re still waiting for the BBC “in production” release officially announcing Spooks series 10, let alone any word on the longer term future of the series. Thanks for this Ian…very much looking forwards to seeing South Riding! What a shame that the continuity wasnt checked, was it just me that noticed that the calf was born with its ear already tagged !! Very clever the vetinary profession in those days. Shame too that the distant shot of the train had British Railways ‘blood and custard’ coaches while when it arrived at the station it had LNER varnished teak carriages!. Loved the original South Riding and great hopes for the new version, if I can stand the loud music. It drowns the dialogue and I have to keep changing the volume every few minutes. This happens in so many TV series, but this is one of the worst. The other drawback is the darkness of the interior scenes. I noticed the train coaches too – they looked like BR Mk1s from circa 1950. The locomotive had its smokebox number covered over on TV, but the website shows it to be 63601, a 2-8-0 goods engine built for the Great Central Railway in 1911 – which is appropriate as scenes were filmed at the preserved Loughborough station. The loco was refurbished at the National Railway Museum in York, and is on loan to the heritage Great Central Railway. The bus was post-war, too. As for the car registrations, the BXT one was slightly off, being issued in London in 1935; the other one with UJ was issued in Shropshire between 1932 and 1937. Interesting post as always. But I now wonder… Winifred Holtby almost married a man named Harry Pearson. And Peter Firth plays Harry Pearce in Spooks. Not the same spelling or character but… I thought perhaps someone had a bit of fun on the Holtby Wikipedia page, apparently not. Just odd that. Perhaps a question for the next interview of Spooks writers. Hi Ian – as we’ve drifted slightly off topic talking about Spooks on your South Riding blog, can I drift a little further and ask if you know anything about a new series of Hustle? Not heard anything yet, Pat. Wonderful adaptation – thrilling. Surely this has the makings of a series – a foundation stone for something in more breadth and depth, following the girls and their head teacher into later life. I wish! First off – brilliant blog. I’m American, and as I’m slightly obsessed with British television, I just happened to stumble across it in a google search. It’s now bookmarked and I check it frequently. HUGE fan of Spooks. HUGE fan of Harry Pearce/Peter Firth. Can’t wait for South Riding to come to American TV next month…esp if PF sports a terrible wig and shares screen time with a cat. This should be good. A huge thank you from America for all your writings (and recordings)! Thanks Kathleen – that’s very kind of you. 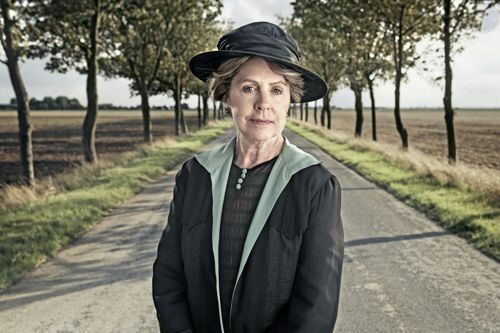 Lots of excellent British TV coming up, including United, The Shadow Line and Exile.